← Congratulations, Sears, on Winning the “All-Time Most Completely Unnecessary Use of Breakdancing in a Television Commercial” Award. 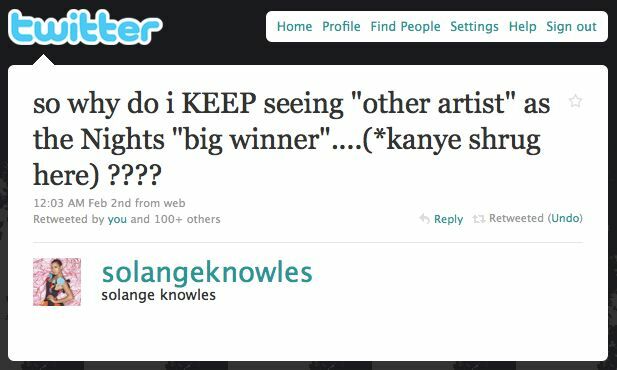 @SolangeKnowles Keeps It Swift: Beyoncé’s Sister Says What, In the Wake Of Kanye, Some People Won’t. 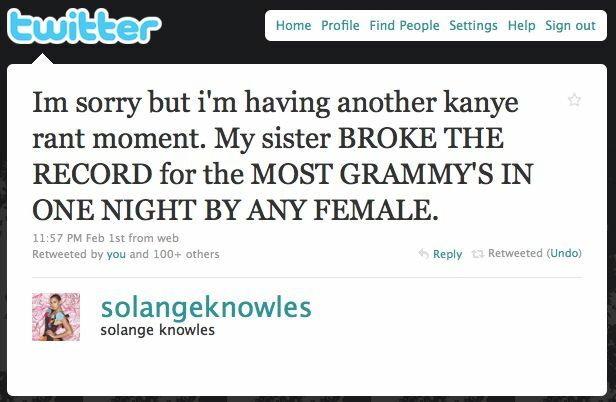 Can’t say Solange Knowles, Beyoncé’s fiery little sis, doesn’t roll hard. In a couple of tweets from Monday night, the day after the Grammy Awards, she questions what anybody with more than four fingers might ask: Why was Taylor Swift, seen here, right, with one of the quartet of awards she won, being deemed the nights “big winner,” when Beyoncé took home six trophies? Deleting the accent on Beyoncé’s name added 400 hits, for 14,800 total. Ouch! Taylor Swift’s painfully weak, off-key vocal performance Sunday night at the Grammy Awards has become the subject of so much on-line controversy that some fans and music biz veterans alike are wondering if she’d have been better off not performing at all. At the very least, her karaoke-level singing made a good argument in favor of using Auto-Tune (the recording studio device that helps vocally challenged performers sound at least somewhat in in tune). C’mon, man: Given Solange’s beef, and Beyoncé’s problems, why you gonna go and dis Jay-Z? I think people are just tired of seeing Beyonce win all of the time. What Kanye did at the MTV Awards may have been in poor taste, but I agreed with the sentiment. It WAS refreshing to see Swift, a young “vocalist” that writes and at least strums a guitar when she made her splash, but I think the media are saturated with her now. Never bought a Beyonce CD–chick music–but I admire her and she keeps it fresh. It is very problematic to me how skewed those Google hits are Assassin and your point is well made. I thought to myself.. why are they showing Taylor Swift more.. and Beyonce is the one that Won more Awards and Broke the record.. Wow!